My Amana dishwasher lights are flashing and blinking. All of a sudden the lights are flashing and I have not washed or even started the dishwasher. Is it possible the electronic controls are bad or faulty? I have read that it may also be the heating element that has become faulty and that can cause the lights to begin flashing and blinking on the front control panel. Can you help me troubleshoot my Amana dishwasher to clear the lights flashing so I can use the dishwasher without calling an appliance repair company? Amana Dishwasher Lights Blinking – How To Reset? 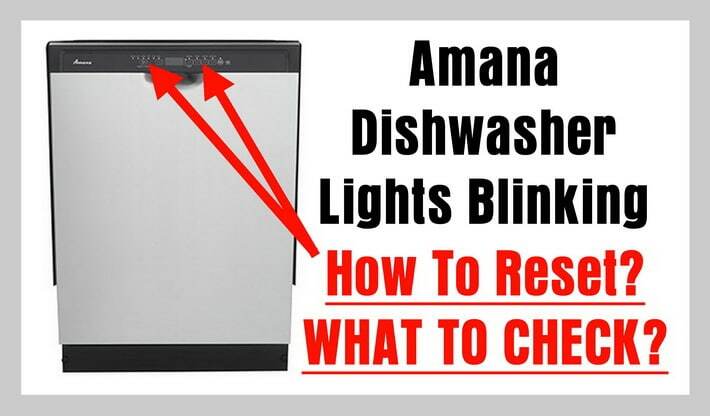 The lights that are blinking or flashing on your Amana dishwasher tell you that your dishwasher may need a reset or may mean a part needs replaced, repaired, or checked and cleaned. NOTE: Always unplug the dishwasher from power before troubleshooting. If your Amana dishwasher has lights blinking, your dishwasher can be reset by simply unplugging the dishwasher for 5 minutes. By removing power to the Amana dishwasher, you may be able to reset the control board and this can clear the lights blinking. – Unplug your Amana dishwasher. – Wait for 5 minutes. – Plug the dishwasher back into power. – Do a test wash and see if the dishwasher has reset and the lights blinking are now clear. The lights on your Amana dishwasher may also blink and flash to tell you a part in the dishwasher is faulty. The heating element inside your Amana dishwasher heats the water. If the water is unable to heat the water to the correct temperature, the lights on the front control panel may flash and blink. You can visually check to see if the heating element in the bottom of the dishwasher has burned out by visually checking it. Look for large burn areas or a broken area on the element itself. If you see no visual clues to it being faulty, you will need to use a meter and check the heating element for continuity. 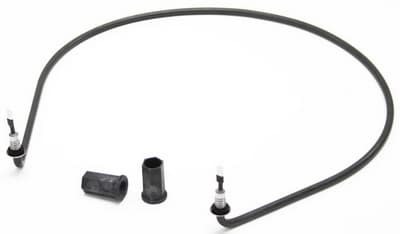 If found to be faulty or it no continuity, remove and replace the heating element. If your Amana dishwasher happens to have a digital display, look for an error code. If an error code does appear, refer to your service manual or find a PDF manual online and follow what the error code is and replace that part. 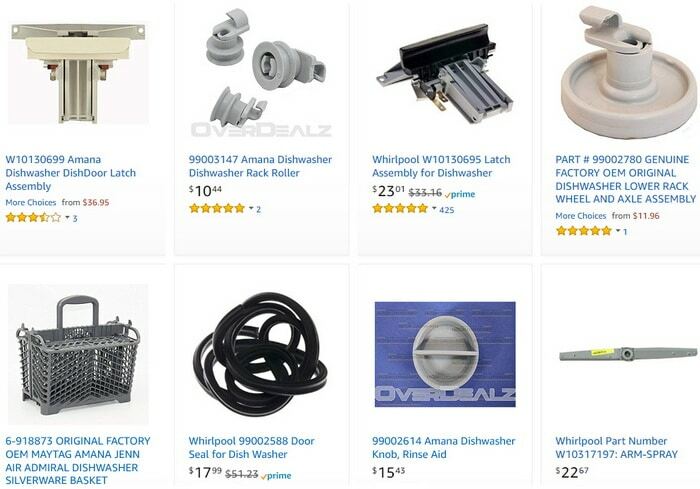 Check here for Amana Dishwasher Service Manuals in PDF for looking up error codes. The pump in your Amana dishwasher pushes water into the drain hose to drain the dishwasher. If you have a faulty or clogged drain pump a light or lights will flash and blink on the front control panel. Check to see if the drain pump is clogged or is blocked and therefore cannot drain out the water. If the pump is clean and nothing is blocking the water from flowing out of the dishwasher, you will need to check the drain pump motor for continuity with a multimeter. 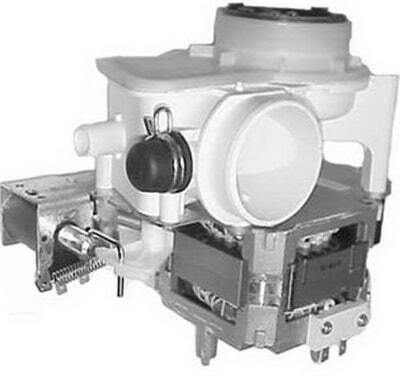 If the drain pump motor has no continuity, remove and replace with a new Amana dishwasher drain pump and motor. There may be an issue with the Amana dishwasher control panel and or touchpad. Check to be sure the control panel is working and illuminated. If any of the buttons do not respond, it may be possible the touchpad or control panel are faulty and needs to be removed and replaced. Use a meter and find out if the touchpad or control board is at fault. Remove and replace as needed. Dishwasher does not run or stops during a cycle? -Is the door closed tightly and latched? -Is the right cycle selected? -Has a household fuse blown, or has a circuit breaker tripped? -Replace the fuse or reset the circuit breaker. -Has the motor stopped due to an overload? -The motor automatically resets itself within a few minutes. -Is the water shutoff valve (if installed) turned on? -It is normal for certain cycles to repeatedly pause for several seconds during the main wash.
-Is the overfill protection float able to move up and down freely? Dishwasher seems to run too long? The dishwasher can run up to 3 hours 30 minutes depending on soil level, water temperature, cycles and options. -Is the water supplied to the dishwasher hot enough? The dishwasher runs longer while heating water? -Is the dishwasher cycle time within the cycle times? -A delay automatically occurs in some wash and rinse cycles until the water reaches the proper temperature. Detergent remains in the covered section of the dispenser? -Is the dispenser door blocked by dishes or cookware when the dishwasher door is closed? White residue on the front of the access panel? -Was too much detergent used? -Is the brand of detergent making excess foam? -Try a different brand to reduce foaming and eliminate buildup. -Are dishes washed only every 2 or 3 days? -Run a rinse cycle once or twice a day until you have a full load. -Does the dishwasher have a new plastic smell? Condensation on the kitchen counter (built-in models)? -Is the dishwasher aligned with the countertop? -Moisture from the vent in the dishwasher console can form on the counter. Dishes do not dry completely? -Did you use a rinse aid? -Your dishwasher is designed to use rinse aid for good drying performance. -Without rinse aid your dishes and dishwasher interior will have excessive moisture. -The heat dry option will not perform as well without rinse aid. -Did you load your dishwasher to allow proper water drainage? -Use a liquid rinse aid to speed drying. -Plastics often need towel drying. -Is the rinse aid dispenser empty? -Did you use an air-dry or energy-saving dry option? -Use a heated drying option for dryer dishes. Excess moisture on racks and dishwasher interior? -Check the rinse aid indicator to see that there is rinse aid in the dispenser. Spots and stains on dishes – Spotting and filming on dishes? -Is your water hard, or is there a high mineral content in your water? -Conditioning the final rinse water with a liquid rinse aid helps eliminate spotting and filming. -Keep the rinse aid dispenser filled. -Always use a high-temp option. -For best dishwashing results, water should be 120°F (49°C) as it enters the dishwasher. -Did you use the correct amount of effective detergent? Use recommended dishwasher detergents only. -Do not use less than 1 tbs (15 g) per load. -Detergent must be fresh to be effective. Heavy soil and/or hard water generally require extra detergent. Is the home water pressure high enough for proper dishwasher filling? -Home water pressure should be 20 to 120 psi (138 to 828 kPa) for proper dishwasher fill. -Sometimes there is a water/chemical reaction with certain types of glassware. -This is usually caused by some combination of soft or softened water, alkaline washing solutions, insufficient rinsing, overloading the dishwasher, and the heat of drying. -It might not be possible to avoid the problem, except by hand washing. -To slow this process use a minimum amount of detergent but not less than 1 tbs (15 g) per load. -Use a liquid rinse aid and underload the dishwasher to allow thorough rinsing. -Silica film and etching are permanent and cannot be removed. -Do not use heated drying. White spots on cookware with nonstick finish? -Has the dishwasher detergent removed cookware seasoning? -Reseason cookware after washing it in the dishwasher. Brown stains on dishes and dishwasher interior? -Does your water have high iron content? -Rewash dishes using 1-3 tsp (5-15 mL) of citric acid crystals added to the covered section of the detergent dispenser. -Follow with a Normal wash cycle with detergent. -If treatment is needed more often than every other month, the installation of an iron removal unit is suggested. Black or gray marks on dishes? -Are aluminum items rubbing dishes during washing? -Disposable aluminum items can break down in the dishwasher and cause marking. Hand wash these items. -Remove aluminum markings by using a mild abrasive cleaner. Orange stains on plastic dishes or dishwasher interior? -It may be necessary to use a stain removal product to remove stains from your dishwasher. -Stains will not affect dishwasher performance. -A hard object has entered the wash module (on some models). -When the object is ground up, the sound should stop. -Is the dishwasher loaded correctly? -Did you choose the cycle that describes the most difficult soil in your dishwasher? If you have some items with heavier soils, use a heavier cycle. -Is the water temperature too low? For best dishwashing results, water should be 120°F (49°C) as it enters the dishwasher. -Did you use the correct amount of fresh detergent? -Use recommended dishwasher detergents only. -Detergent must be fresh to be effective. -Heavy soil and/or hard water generally require extra detergent. -Is detergent caked in dispenser? -Do not allow detergent to sit for several hours in a wet dispenser. -Clean dispenser when caked detergent is present. -Is the pump or spray arm clogged by labels from bottles and cans? -Is the home water pressure high enough for proper dishwasher filling? Are high suds slowing the wash arm? -Do not use soap or laundry detergents. Dishes are damaged during a cycle? -Did you load the dishwasher properly? -Load the dishes and glasses so they are stable and do not strike together from washing action. -Minimize chipping by moving the rack in and out slowly. Need help with your Amana dishwasher showing lights flashing, blinking, or error codes? Please leave your question below along with your Amana dishwasher Model number and we can assist you in fixing your dishwasher. Next post: 13 Reasons Why A Washer Leaks – Water Under Washing Machine – Is It Leaking Or A Spill?